11:35pm – 11:50pm Camera 3 &4 Caleb and Paola continue to talk. Paola asks what ethnicity his last girlfriends were. Caleb says the last two were asian. And they both did me wrong. I treat a girlfriend like I treat my mom too. Caleb say that he chose his nominations by who were the first to fall off in the competition. Caleb says that Frankie did it differently .. we weren’t able to talk about it .. he put up the first two girls who fell off. Paola says that she is scared and really wants to be here. I scaraficed so much to be here and me and my mom connected for the first time before I came here. Caleb talks about how the “sucky” part of his exterior is that people judge him before they know me. Paola says its obvious she has feelings for you. Caleb says she is just scared to let me know that. If she doesn’t she is playing it really good because she likes to look at me and talk to me. Amber comes by and Paola tries to cover up the coversation by saying you’re ex-girlfriend right?! Caleb doesn’t understand. Amber stops by and then heads to the bedroom. She comes back and they all head to the fire bedroom to make the bed. Amber says we should go to bed early too.. theres the competition. Paola says first of all I am competing against 3 strong people. She laughs. Devin joins them. Caleb leaves. Nicole starts rubbing Christines hair again noted by other houseguest show close these two have gotten . She Explains Frankie about what the live feeds are all about. Frankie is revealed that there is some filter he was under the impression that they could see all the cameras all the time. Hayden mentions you have to do something awesome for the cameras to be on you. Dertrick is trying to teach Victoria how to play chess. They whispering about Devin being a threat. 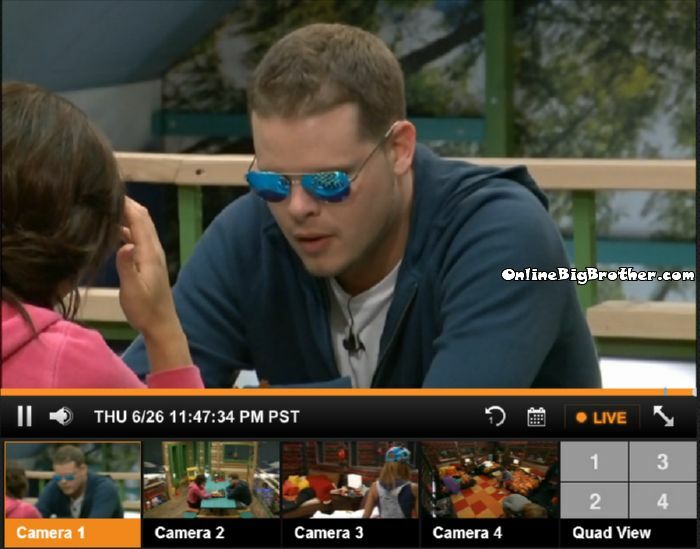 Derrick says Victoria shouldn’t win the POV tomorrow. Derrick tells her if she wins the POV Paola will come to her and try to get her to use it. Victoria says the plan is to leave the nomination the same. Derrick says if Caleb wins the POV the noms are staying the same. Victoria asks if people are talking about her. Derrick says she’s this week she’s just a vote she’s irrelevant. He points out she’s onto next week already. Victoria says Nicole is scared she’s going to get backd**red. Derrick brushes it off says it’s only Nicole getting paranoid. 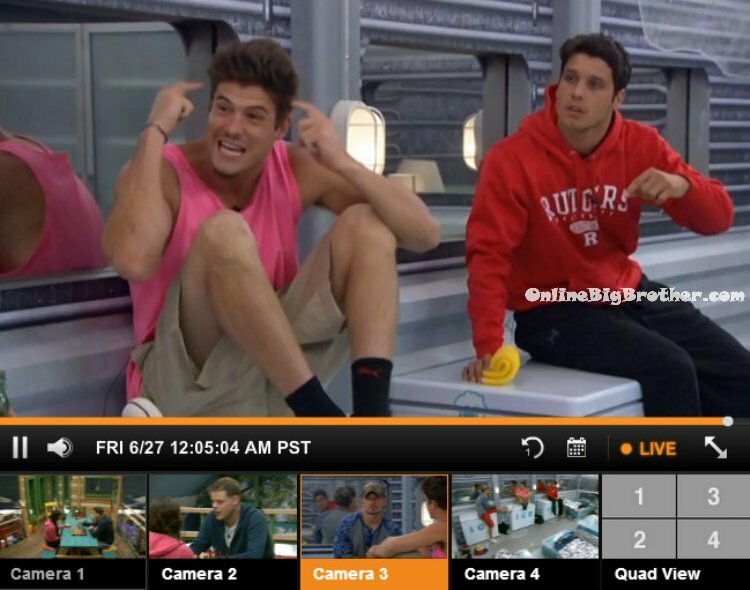 11:50pm – 12:10am Cameras 3 & 4 The cameras switch to Zach and Cody in the havenot room. They talk about how they want to win the POV competition tomorrow. Zach says he wants to win it just to be able to say that he did. Zach lays out clothes on the havenot bed to try and make it more comfortable. Brittany and Frankie join them. Brittany puts on her ear muffs and asks who wants to go in my HOH room. Brittany and Joey are going to sleep in the same bed. Frankie starts putting the foil over himself. Caleb and Joey join them. Brittany, Joey and Frankie leave. Caleb tells Zach and Cody … Yeah we got power houses in the POV. Zach says yeah but I’m winning it! Caleb says I forgot I get to play in it. They talk about how if Donny won it they would just put someone else up and send them packing. Zach says that Paola isn’t smart. Caleb says if the Veto is used he would put up Joey and have her sent home. Caleb says everyone thinks that Donny is who he says he is .. but he is something else.. Cody says he is like a professor. Caleb says I like him and he’s funny but he can go. Caleb leaves and Devin joins them.